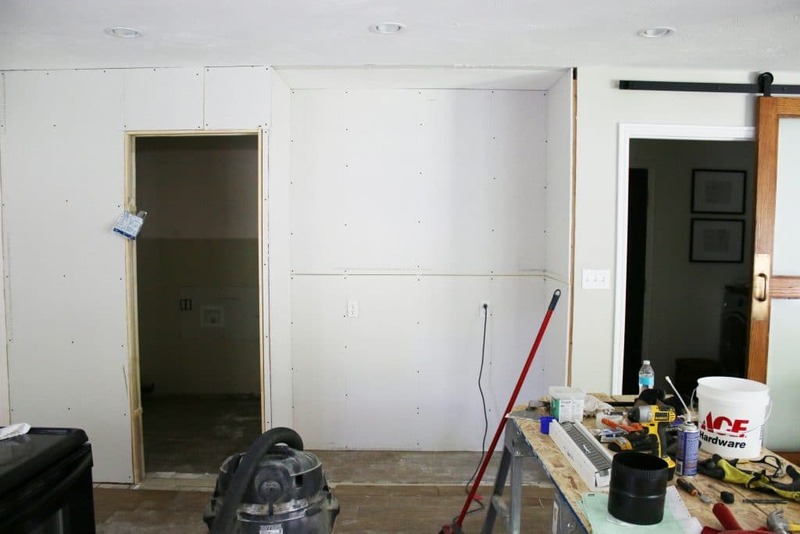 We’re diving head first into updating our current kitchen!! 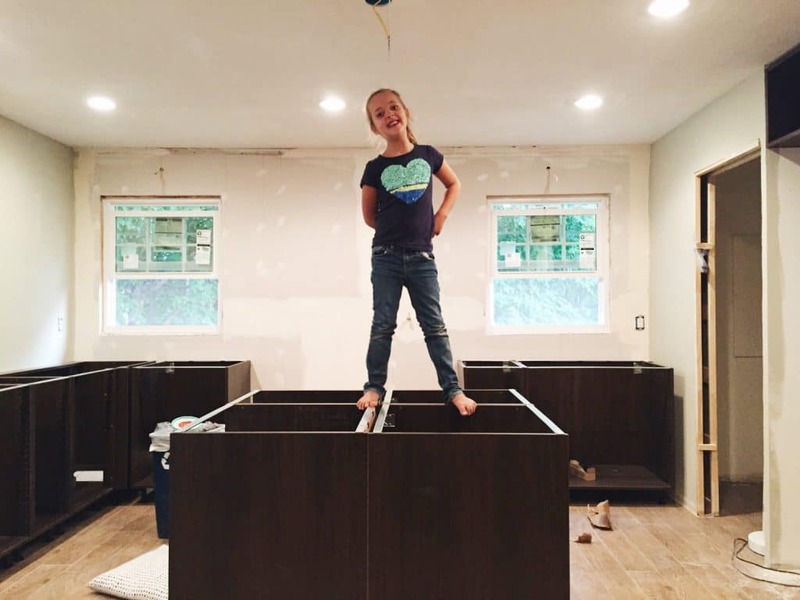 After we recently finished the floors, our cabinets are looking more orange than ever and we left a disposable table cloth on our island in place of a countertop. Eeeks. Although we are planning a full kitchen remodel next year (?? 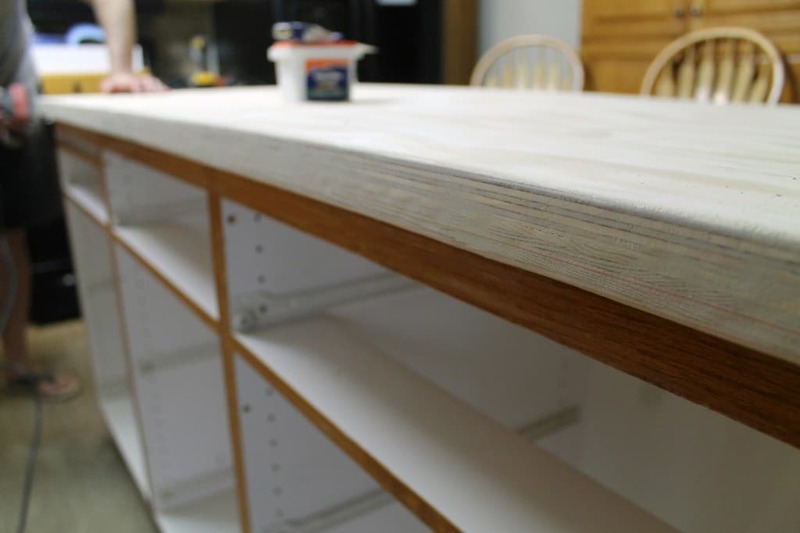 ), painting our cabinets is an easy and cheap way to happily wait out a full-on remodel and we came up with this simple DIY faux soapstone countertop for our island this weekend! 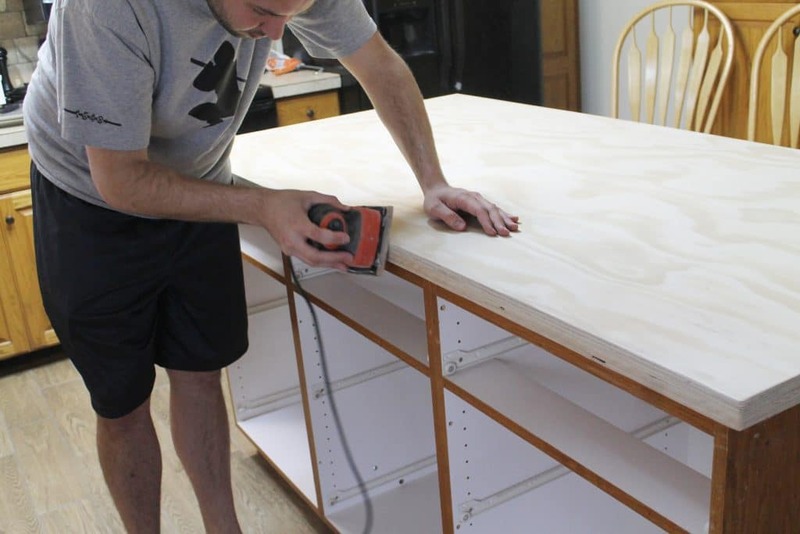 Ace Hardware is celebrating their 90th anniversary this year, and being part of their blogger panel, they challenged us to do a project with just $90. We’re happy to report, this project came in under the bill! 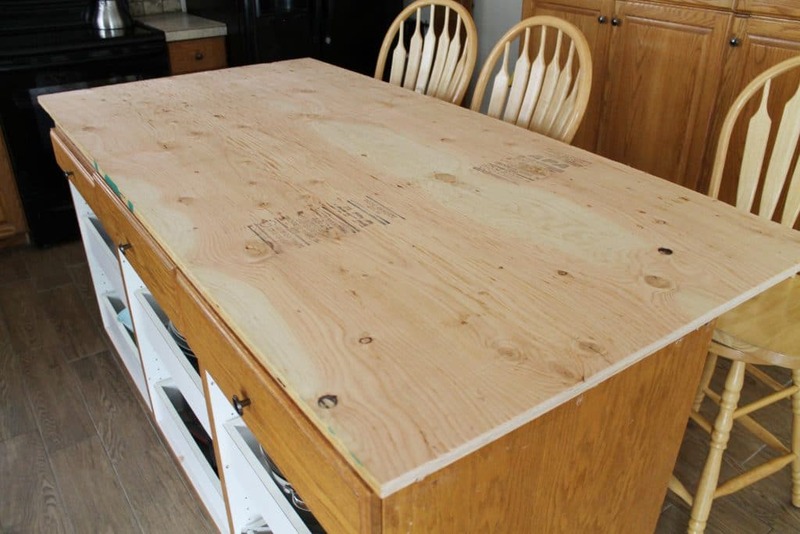 When we reconfigured our island, we put this piece of cheap leftover 3/4″ plywood on top and covered it with a tablecloth. 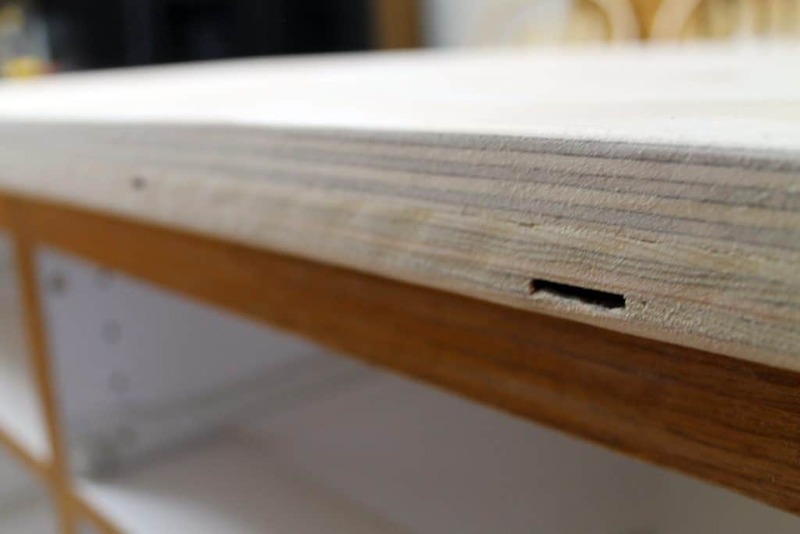 While this cheap plywood served as a great base, it was full of knots and was extremely rough. 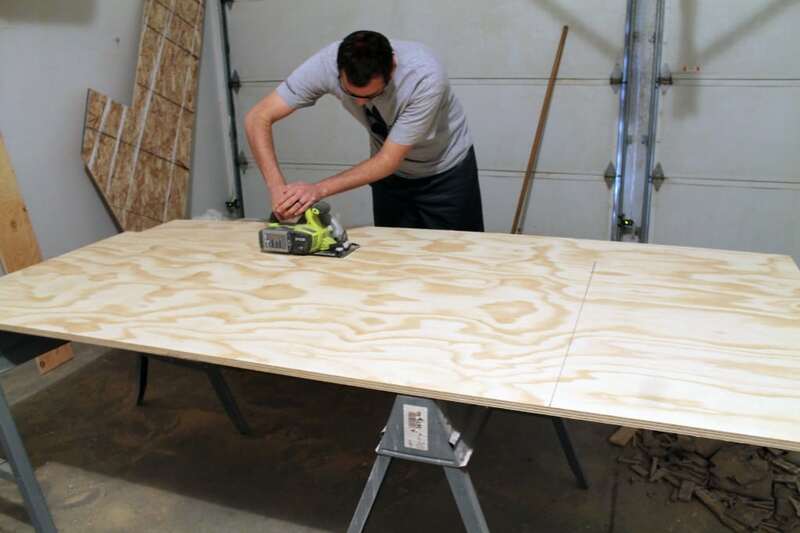 So the first step was to top it with a cabinet-grade plywood which is a lot smoother and higher quality. We decided to go with 3/4″ again, so the finished countertop would be a beefy (okay, pretty standard) 1 1/2″. To adhere the two pieces together, we used construction adhesive first and then drove 26–1″ screws through the bottom. No matter how well you measure and cut, chances are the two pieces won’t be exactly the same size–at least that was the case with us. Chris used a manual planer we picked up for $13 at our local Ace to quickly even up the edges of the sheets of plywood so they were flush with one another. With the edges flush, we didn’t have to spend too much time sanding but we still decided to do a once over and slightly round the edges, too. 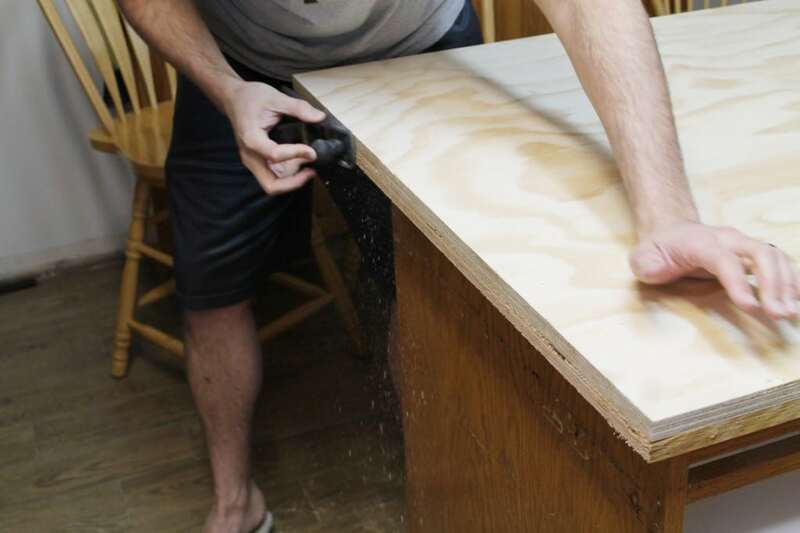 A lot of imperfections showed up after the planing and sanding–mostly in the cheaper sheet of plywood–but it was nothing a little wood filler and one more round of sanding couldn’t fix. 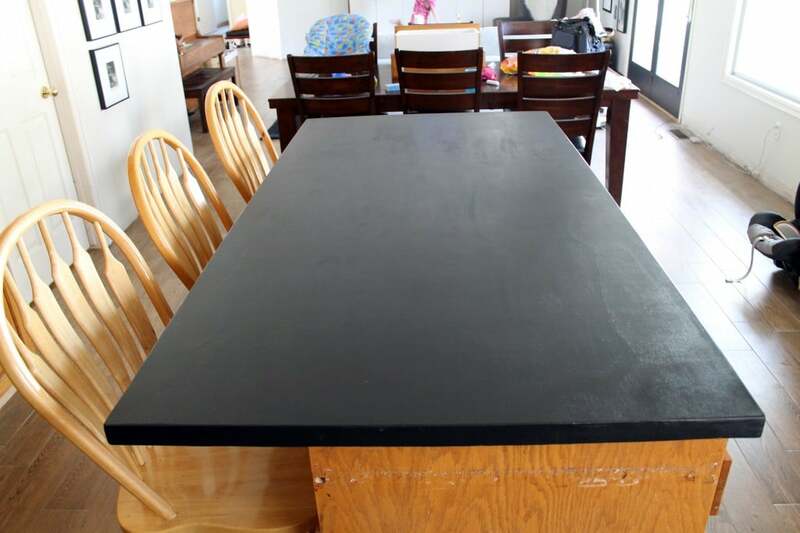 At this point, we had a smooth 1 1/2″ countertop ready for the faux soapstone treatment using rustoleum chalkboard paint and paste wax. I layered on 4 coats of chalkboard paint with a small foam roller, waiting a few hours in between each coat. After the paint set up for 24 hours, we lightly sanded the whole surface with a fine-grit sanding block to keep it nice and smooth. I actually drew some fine lines, a la soapstone, with gray chalk on the surface but as soon as we applied to paste wax to seal the countertop, those lines disappeared. Ha! We’re happy with the results just the same. We followed the instructions on the paste wax, and applied the wax in even strokes with a t-shirt cloth with the grain and let it dry into a haze before buffing it out. The chalkboard paint provides a good varied charcoal black like soapstone for a minute fraction of the price. But more than anything, it’s nice to have a durable work surface finally. 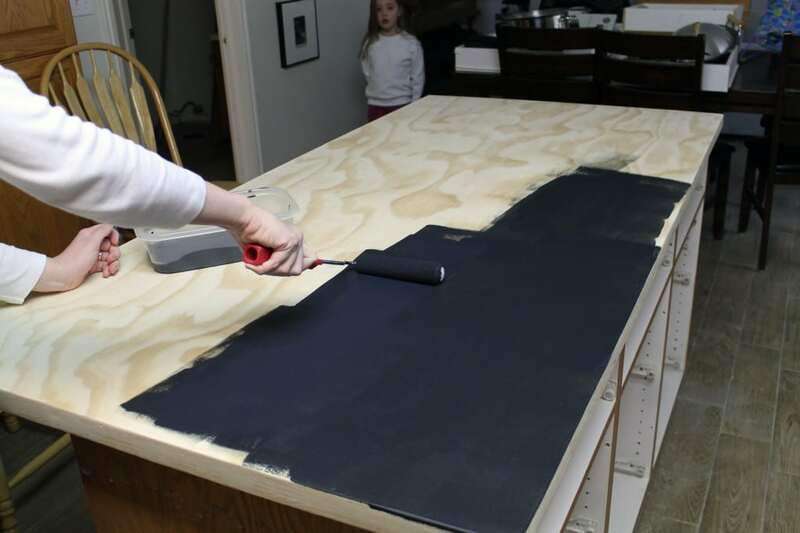 We can’t wait to start painting cabinets and update those stools and a few other quick-fixes to make this space less of an eyesore–this faux soapstone countertop was the perfect springboard and for less than $90? Icing on the cake. We’re excited to be collaborating with Ace Hardware as a part of their Ace Blogger Panel this year. Ace has provided us with compensation and a $90 Ace Hardware Gift Card to complete this project (and celebrate their anniversary!) but all ideas, opinions and sweat are our own. That’s A Wrap on Kitchen Demo! The Kitchen’s New Layout, with Walls and Everything. 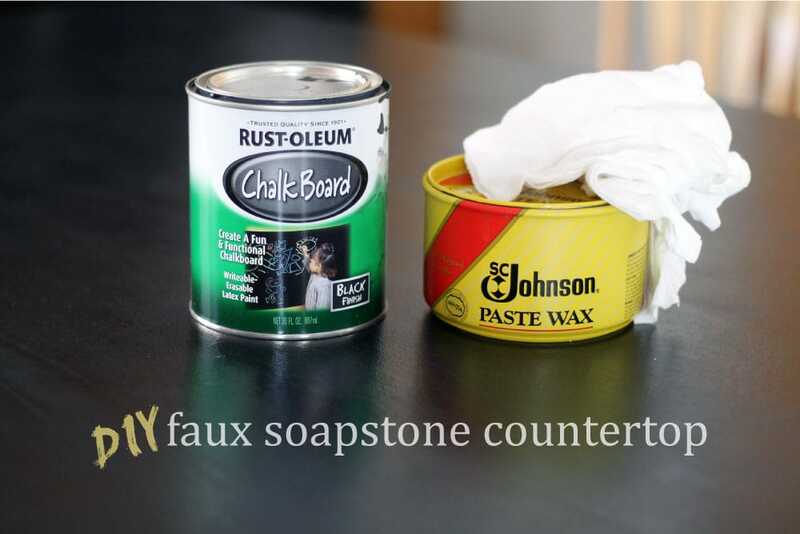 are you able to prepare food on the faux soapstone countertops? We did – we just kept up the paste wax coat. 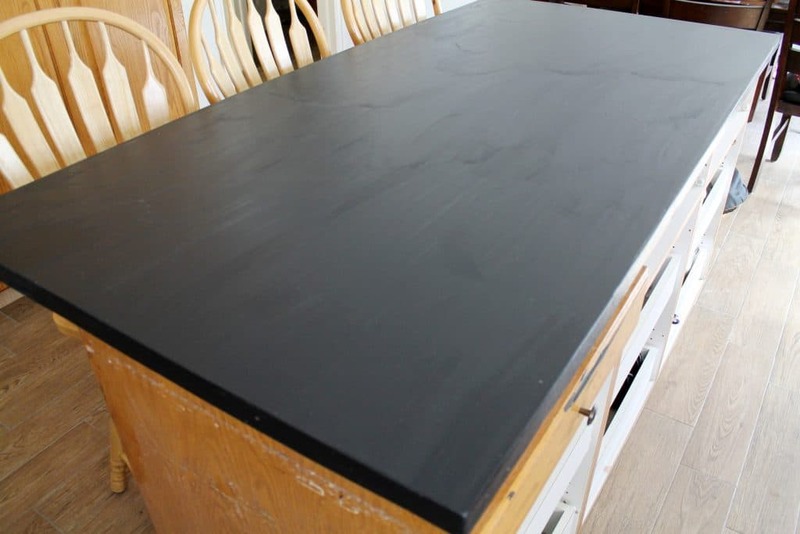 I am currently pretty set on doing my countertops with the chalkboard paint for the soapstone look…was wondering how the wax finish alone has held up as I have seen similar techniques published only finished with polyacrylic as opposed to wax. Yours look beautiful! This was just a temporary fix for us. We swapped out the countertops 3 years ago for white concrete, which we love. Wondering how you think this would hold up as a short term bathroom countertop. Thinking a year or two until we totally redo our bathroom. Would the wax protect it from water damage? That’s a bit riskier, but butcher block is used around kitchen sinks and works well as long as you keep it protected and wipe up any wetness pretty quick. You’d definitely want to wax it often if you do decide to try it. best blogs on the net. I’m going to highly recommend this blog! 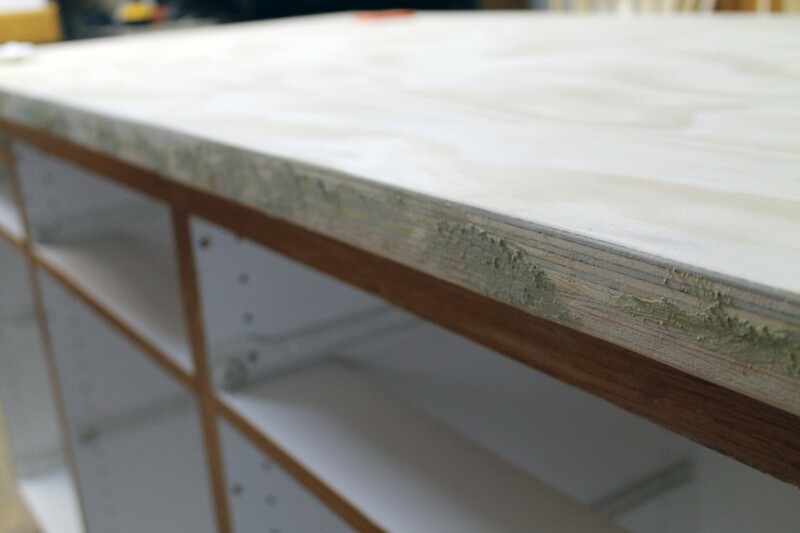 How durable is this countertop? It’s surprisingly durable, but we only used it as an interim countertop. Can u make tutorial in video ? I want to learn a lot from you. Media manufacturing specialists may select titles, music, animation and narration; edit and prepare video; and develop program materials. Please use the login kind on the high of this web page. However the American center class is dropping out. Looks great. Just curious what the final dimensions of your island are? provide real information versus the leisure mass media shops spew to maintain viewers. not less than 80 hours… earlier than anymore human tissue…. you need to have good tattoo habits, and good ethics. on route to the venue. topic to be actually something that I think I might by no means understand. articles orr reviews all the time along with a mug of coffee. Considering this for our vacation home, it looks like a perfect solution for what we are thinking! How is it wearing? We are right in the middle of our kitchen renovation now, so it is gone although it served its purpose and wore very well while we had it. this onto a suitable size card, after inserting the who, when, where details somewhere within the frame. Quality content is the main to attract the users to visit the website, that’s what this website is providing. you heard of Pink Sugar Shoe Boutique. Delay going for things like the Driving School because you’ll need loads of staff. nicho de mercado según Google. vibrations and elevate the mind to a higher lever of consciousness. the pet products we sell on all. answers to his customers is written for by Andrew Dunlop. chaise lounge chairs oor youu can see tis thing. We now have or even metal frame. factors with an Xbox Reside profile. We have older laminate countertops but some of the edge pieces have chipped off. So they need to be redone. I have always wanted soapstone and since my husband doesn’t want to put the $ and time into a home we only plan to be in for another year, I’d like to try it! 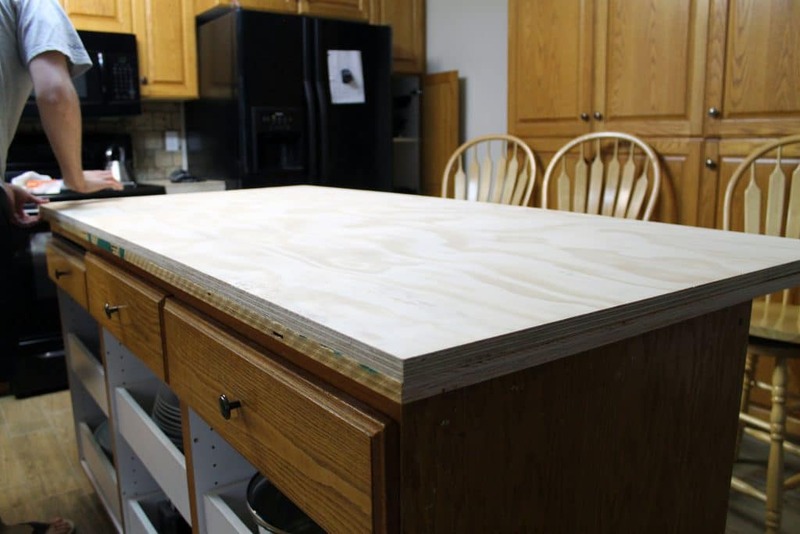 I’m not sure how we would do it though, if we put plywood on top it would raise the countertop surface and not sure how that works with the sink lol..
I’d rather try to scuff up the laminate with my sander, use wood filler on the chipped edges and try this? I am curious as to how you clean it and how it has held up. Thanks!! I love the way this turned out. I’m thinking of doing my countertops. Can I put this over my laminate counters? Or do I have to replace them? There in good shape, just out dated. I’m hoping I can fill in the little lines where there come together. I’m doing a red black & white country kitchen with all my roosters & metal signs. I’ve also considered using plain sheet metal on the counter tops, was told this was great for baking & placing hot pans. Also inexpensive & easy to just cover what I have. If I used that how would this look on cabinets? I loved the distressed look but want it sturdy. Thanks for the great idea!! Not sure if you will see this since it’s an older post but I was wondering how you think this would work if done over laminate versus the plywood? I was planning on sanding, then a coat of bonding primer meant to go over glossy surfaces, then 2-3 coats of the chalkboard paint, then the paste. I’ve only seen this done over plywood so I am slightly nervous! I bet that would work like a charm, Jessica! Did this on our island with laminate top about 3 months ago. We scuffed the surface of the laminate pretty well and have only had a few super tiny chips (livable for now). I would recommend getting serious about roughing up the laminate or consider replacing with a couple of layers of plywood like these guys did because the chalkboard paint really seems to need a porous surface. The way the chips look, i am not certain the primer would help. I have also recently found out that one can purchase new laminate to go over existing laminate and they even sell a soapstone print. Glues on with contact cement but not meant for laminate countertops with rounded edges. If someone really wanted the vein look, I wonder if using some sort of spray fixative over the chalk but before the wax would help? Not the most food safe, but depending on the use of the surface could look pretty cool. She made plans for her little place in 2012, and has her own blog. I’m curious if you had seen that one, or another blogger or DIYer, or perhaps you came up with it organically? It seems like a great move for an inexpensive solution. The difference here being that the counter tops in Carmella’s case were not meant to be temporary, it was a necessary budget move, and apparently hers have held up well. Oh my goodness! I just fell into a link fest! I HAD seen Carmella’s kitchen somewhere recently (pinterest?) but was met with a dead link. Booo. Thank you so much for all of these links. I somehow ended up on a post about the Something’s Gotta Give house and apparently they used the same technique for the countertops in that movie to imitate soapstone (except with MDF). How cool! great idea! love the finish the wax leaves. I’m so interested to see how this wears! It’s really pretty and is a great inexpensive upgrade if it wears well! 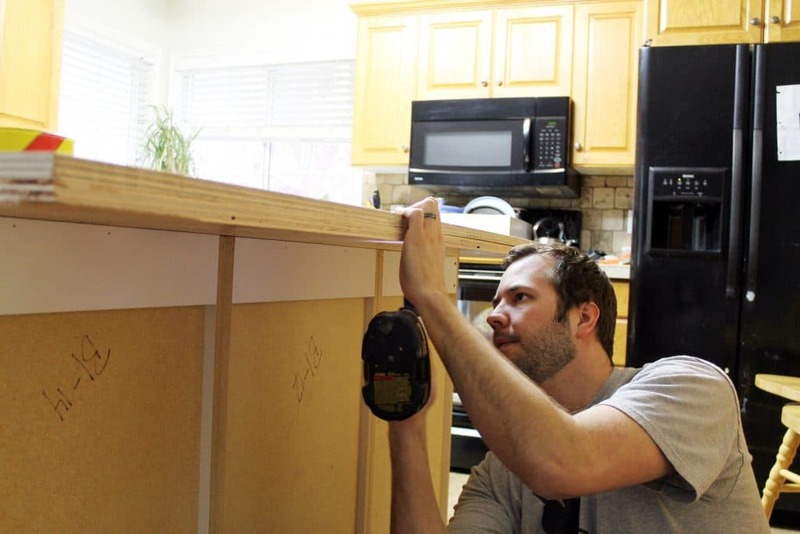 Do you think it will work better than the painted counters in your old house? I followed your lead on that one and did it in our house to cover pink laminate counters. It’s wearing okay… still an upgrade from the pink but it does have a few small chips. I’ve touched up once but it’s kind of a hassle since it has a long dry time and strong smell I probably won’t touch up again. Hopefully we can replace with something more permanent soon, unless this ends up performing amazingly! Thanks for always having great tips and fresh ideas! We had the same experience there with the painted countertops. We had them for about a year and it was completely worth the $20 it took to paint them, even if they did chip before we put in our black walnut countertops. We consider this an interim upgrade as well, but we’ll keep you posted on how this wears! I think it looks great! I wish I had thought of it and am looking forward to seeing how it wears. 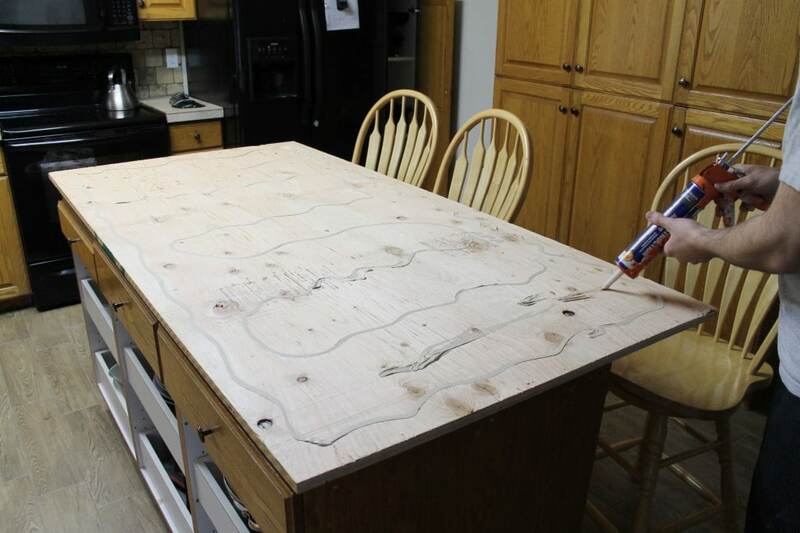 Painting plywood does not a countertop make. I hope you are not keeping this around for very long. Hideous. 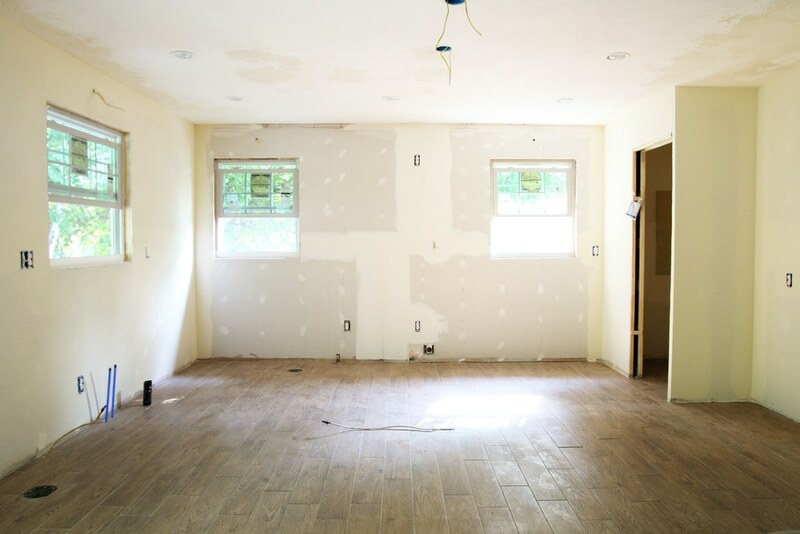 While this is a temporary solution for us until we renovate our kitchen, you may be surprised to hear that people actually stain and seal high-quality plywood (like we used here) for countertops. Maybe it isn’t your taste–but hideous? Pretty harsh, don’t you think? By the way, thanks for this great dyi post. 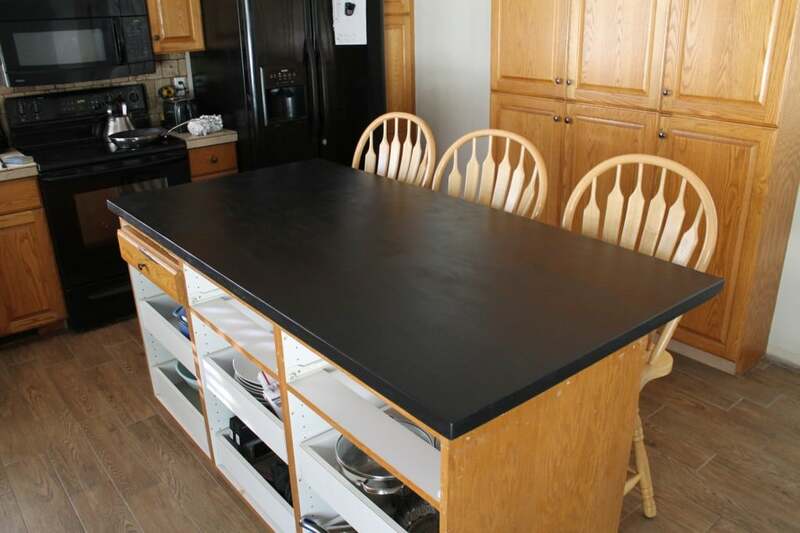 I did my countertops with the chalkboard paint and wax, but I want to go darker. Do you know if I need to remove the wax first (it’s been almost a year)? If yes, do you know how to remove it? maybe alcohol…mineral spirits…heat?? I don’t see hideous anywhere in any of the pictures…. Maybe money is no object to YOU- CONGRATULATIONS !!! But to some of us (I’m a farmer) this is a GREAT temporary (or maybe permanent) solution ! BTW- I made an island countertop for $62 a few years ago, it still looks AMAZING and everyone thinks it’s natural stone…. $ does not a beautiful house make. I am picking up so many swatches this week and hope to post about it next week. I’m torn! I have never used paste wax before so I don’t fully understand how it works once dry. I am imagining a melted ring where a warm plate sits, or a young child eating crumbs off the counter and coming in contact with dangerous chemicals. Is it food safe? Would it be damaged if you placed a warm plate of food on it? Any tips? Thanks! Great questions! The paste wax is carnauba wax based which is food safe. As for the warm plate, we’ll have to keep you updated on how it wears. 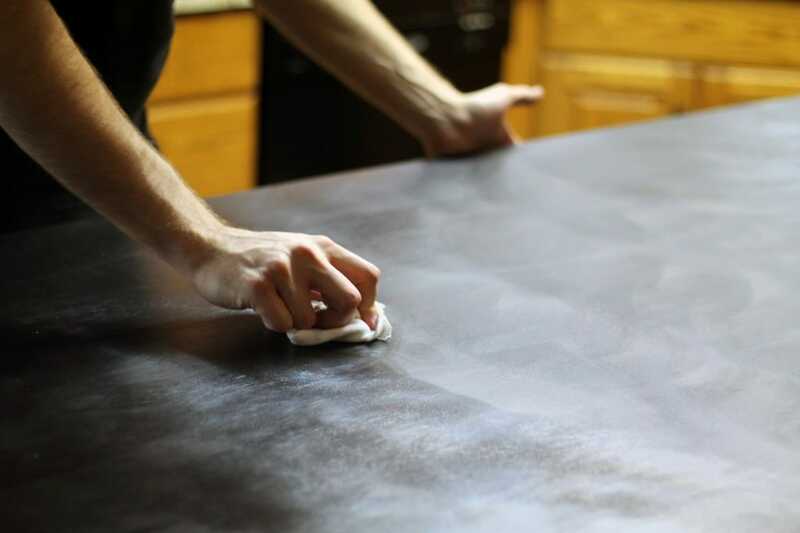 The wax is used as a sealant and is then buffed off, so the counters now don’t feel waxy–just satiny. I’ll definitely do an update post in a couple months for ya! Thanks! I guess in my mind a wax rubbed over top is thick rather than the smooth thin coat you are describing. It looks really great and gives me an idea for our garage workspace. I just googled it and the melting point is a very low 140 degrees – so better not sit a cup of coffee on it! Other than that, looks good! I called the manufacture , They do not recommend this product for counter tops…the sds states that there are carcinogens in this product. Looks great! Love the finish. This looks really great. I’m not sure if you mentioned it, but is there a reason you chose chalkboard paint instead of a flat black latex? Chalkboard paint dries into a slate-like surface unlike latex paint. Also, I originally drew some veins on the counter with chalk before adding the paste wax, but that didn’t work out. We opted for the chalkboard paint mostly for the texture and color. Thanks, Julia. Its so interesting to see a use for chalkboard paint that isn’t for a chalkboard. What an amazing idea!!! 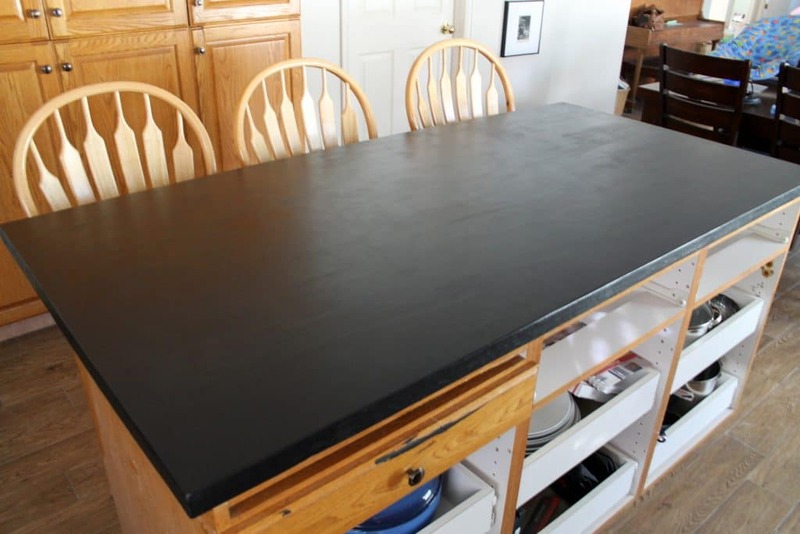 I had no idea you could create kitchen island top with chalkboard paint and wax. Too cool! What a great idea. It looks really good. Whoa, first time I’ve seen something like this! Pretty neat. What does the finished product feel like to the touch? Dry? Waxy? In any case, very creative work, good job! Thanks Lisa! The finished product feels smooth and silky–not waxy at all. I’m wondering how the wax finish holds up with water spills, hot coffee cups on it, ? Doesn’t wax melt when you place a warm cup on it? I can’t believe you did that for $90. What a great option for something temporary or even something like a vacation home where you dont have a ton to spend. I’m in love with the finished product!